Directors/Screenplay – Stephane Aubier & Vincent Patar, Producers – Philippe Kauffmann & Vincent Tavier, Photography – Jan Vandenbussche, Music – Dionysos & French Cowboy, Animation – Stephane Aubier, Marion Charrier, Zoe Goetgheluck, Florence Henrard & Vincent Patar, Production Design – Gilles Cuvelier. Production Company – La Parti Production/Made in Productions/Melusine Productions/Beast Productions/Gebeka Films/Les Films du Grognon/RTBF (Television Belge). 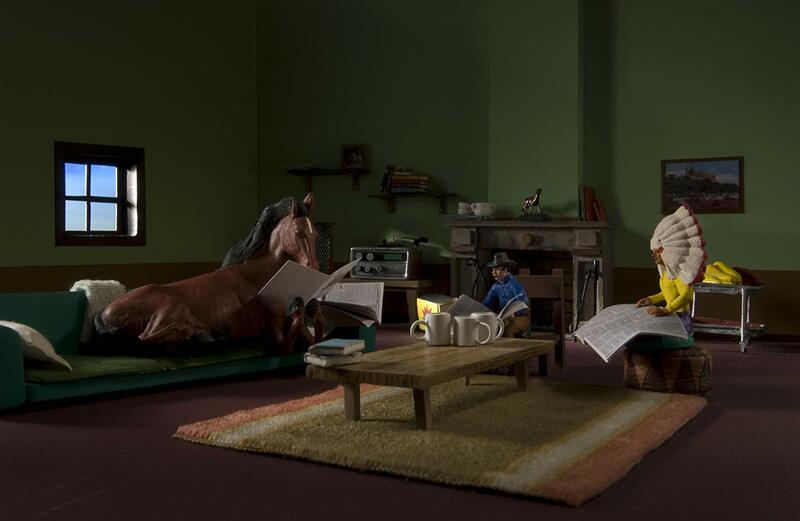 In a small village, a horse, a cowboy and an Indian live together in Horse’s house. Cowboy and the Indian realize that it is Horse’s birthday and panic over not having brought him a present. They decide to build Horse a barbeque but need more bricks. They trick Horse into leaving the house so as to use his computer to order some bricks over the internet. After placing a coffee cup on the keyboard, they accidentally order 50 million bricks instead of 50. They hide these by piling them on top of the house but these cause the house to collapse in the middle of the night. Horse, Cowboy and the Indian take refuge at the neighbouring farmer Steven’s barn and the next day set about rebuilding the house. However, each night someone steals the walls they erect. They set a trap for the culprits and discover that fish people from underneath Steven’s pond are stealing the walls to build their own home underwater. Their attempts to pursue the fish people end up creating a war between the surface and the fish people. I must admit prior to going into A Town Called Panic to have some doubts about the idea of an entire film featuring children’s plastic model toys. 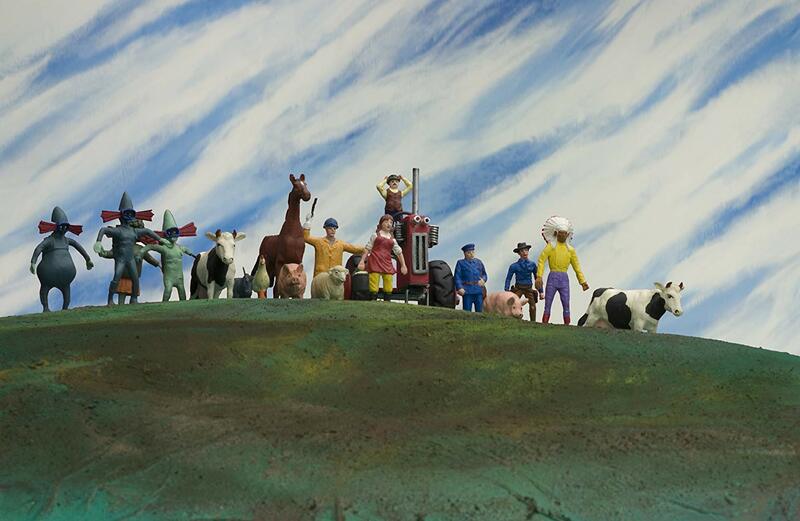 The characters are the types of figurines that come in mass-produced playsets, the sort that I can remember getting to populate the town and stations for my model electric train set as a kid. Cowboy and Indian even come with plastic bases as they move around. Most of the figures are smaller the size of my little finger going by the production stills and have been brought to life through stop-motion. It is an experiment in conceptually wacky filmmaking, albeit one that seemed just too cute for its own good when one first heard about the film. In defiance of one’s expectations, within a matter of minutes A Town Called Panic settles in as something thoroughly unique, developing out with an hilarity of wit that is quite sublime. Despite its low-tech and seemingly crude methods, A Town Called Panic is far more entertaining than the majority of multiplex-released animated films to come out this year. A Town Called Panic comes from Belgian animators Stephane Aubier and Vincent Patar. The idea of animated plastic toys came to them at film school and they conducted initial experiments on sets of drawn cardboard. The embryo of A Town Called Panic was Stephane Aubier’s film school graduation project in 1991 and several years later the duo premiered A Town Called Panic (2000) as a tv series on the French cable network Canal, which consisted of 20 four-minute episodes. Released as individual shorts, these became acclaimed hits at various film festivals and were dubbed into English under the supervision of no less than Aardman Animation. Aubier and Patar then spun the characters out as this feature film, which had the distinction of being the first full-length stop-motion animated film to play at the Cannes Film Festival. Other reviewers were quick to make comparison between A Town Called Panic and Aardman Animation’s work, of which there is superficial similarities in that both are stop-motion animated films in a comedic vein. Unlike Aardman, A Town Called Panic derives its charms from its low-tech approach and the wacky novelty of seeing plastic toys come to life. Another comparison might be to Wes Anderson’s recent Fantastic Mr. Fox (2009), which comes closer to the same ballpark with its scrappy low-tech stop-motion animation. For me, the comparison was more akin to the deliberately unsophisticated 2-D animation of tv’s South Park (1997– ). You could say that A Town Called Panic is to the stop-motion animation films of Henry Selick – The Nightmare Before Christmas (1993), Coraline (2009) et al – what South Park is to Pixar and Disney. On a level of plot description, A Town Called Panic would not be too different than say an episode of some children’s tv series like Bob the Builder (1999– ) or perhaps its closest counterpart Gumby (1953– ). The difference is that A Town Called Panic has a sense of humour that comes pitched to adults. The plot – a picaresque that travels through various escapades from the brick buying fiasco to the problems with the stolen walls from the cone-headed fish people and side ventures down to the centre of the Earth and encounters with scientists in a robotic penguin (one point that the film seems to cross over into Aardman Animation territory), and of course Horse’s tentative attraction to the red-maned piano teacher Miss Longray – is suitably nonsensical and rambling. It is some time since I have had so much outright fun and laughed so often in an animated film. There is a deliriously nonsensical surrealism to the images of day-to-day life in the house – be it the trio waking in the morning and Horse getting into the shower as Indian dries his feather headdress under a blow-dryer, or of Horse going to bed and kicking his horseshoes off and pulling a blanket up over himself. There are all manner of charmingly offhand pieces of absurdist nonsense – like the surprise birthday cake for Horse made of chocolate-covered hay to the pig that climbs up onto its own spit. The climax of the film is a madcap siege against the merpeople who barricade themselves up in the house firing swordfish via bows, while Horse, Cowboy and Indian fire pigs back at them and cows catapulted off trampolines. The original A Town Called Panic shorts have become cult items in Europe and internationally in dubbed form on YouTube – there is no reason why the film version should not as well. Madcap inventivity like this should be seen by everybody. A further film was released with A Town Called Panic: Double Fun (2016), edited from some of the short films. Directors Stephane Aubier and Vincent Patar next went on to direct the charming animated children’s film Ernest and Celestine (2012). (Winner in this site’s Top 10 Films of 2009 list).